Identifying the optimal treatment progression for a complex patient is essential in today’s health care environment. Therapists must combine all of their skills, whether neurological or orthopedic, in order to develop progressive programs that are efficient and safe for geriatric clients. This intermediate-level course begins with more than two hours of evidence-based information, a preliminary lead-in as to how to treat your complex geriatric patient. In addition, essential information will be provided on how to identify red flags, perform thorough evaluations and set realistic functional goals for the complex geriatric patient. Case studies of patients with multiple diagnoses will be presented in a systematic sequence so that the appropriate understanding of how to prioritize your approach can be established. Working with developmental sequences will enhance the patient’s coordination, balance, strength and range of motion and will produce a positive result in the patient’s ability to perform activities for daily living, maximize fall prevention, and reduce re-hospitalization. 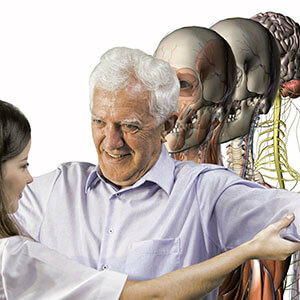 By utilizing developmental sequences in conjunction with traditional rehab practices, therapists should possess the knowledge base to treat complex geriatric patients with multiple diagnoses, including MS, Parkinson’s, post CVA, head injuries, obesity, total hip and/or knee repairs, osteoarthritis, as well as other orthopedic issues. This course will sharpen your critical thinking and creative problem-solving skills. Patient scenarios and video analysis will be used to identify impairments of ADL’s for both the neurological and/or orthopedic geriatric patient. Participants will have plenty of hands-on time for practicing neuro-developmental sequencing, joint mobilizations and manual therapy, progressive functional activities and exercises. This course will provide physical therapists, physical therapy assistants and occupational therapists with the skills needed to treat the complex geriatric patient. The theories and facilitation techniques learned will benefit therapists working in acute rehab, outpatient and home health settings and can be immediately applied to clinical practice. Clinicians will be provided with course handouts and resources to serve as reference material upon completion of the course. Assess vital signs, cognitive function, cardio, respiratory function and skin integrity, balance and functional limitations of the complex patient. Applying these skills when working with the acute rehab, outpatient or the home bound patient. Demonstrate how to utilize the proper cognitive and functional evidence-based assessment tools to establish baselines and progression of care to reach targeted outcomes. Describe the benefits to utilizing progressive developmental sequencing to optimize coordinated functional movement. Utilize evidence-based tools to evaluate deficits in mobility and/or stability in the complex geriatric patient . Develop strategies to reducing re-hospitalization rates. Analyze abnormalities in the components involved with functional movements and prioritize a treatment approach to improve an individuals functional patterns of movement. Prioritize impairments when developing comprehensive treatment programs for the geriatric patients with neurological and/or orthopedic problems. Perform hands on techniques to facilitate the functional activities of daily living; including soft tissue mobilization, manual therapy (PNF), joint mobilization, muscle strengthening, and range of motion activities. Describe the initiation of movement (stability to mobility and coordination) when utilizing developments sequencing to enhance functional motion. Identify key strategies for interventions for fall prevention. Integrate basic EBP principles of treatment into the developmental sequence for more comprehensive functional outcomes. Discuss strategies for billing and job opportunities in our ever-changing health field. 30 years of working primarily with the complex geriatric patient and getting them back to living a more functional life while integrating the patient’s hobbies into my treatment plans. I will share my experience!